This new release from GOTHIC KNIGHTS has been a long time coming. It’s been nine years since their last album, “Up From The Ashes”, so have fans been given a good reason to wait so long? Spoiler alert: the answer’s yes. 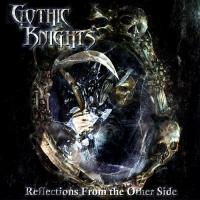 To be honest, “Reflections From The Other Side” is an eleven song long album of GOTHIC KNIGHTS doing what they do best. This band is all about the Heavy Metal with a Fantasy Power Metal element. They have huge riffs, power vocals and awesome lyrics. I think it shows that there’s been such a long gap between albums, because this is tight, and really well produced, and I think that it is GOTHIC KNIGHTS showing you all their best material. You can definitely hear a lot of influences from bands such as IRON MAIDEN and JUDAS PRIEST. There’s quite a bit of a mixed bags of styles here, for example if you prefer your more classic Heavy Metal, “The Omen” is for you, and if you prefer stuff to be a bit heavier, “Zero Hour” is a good source for that. There’s a lot of riffs throughout this album, heavy and awesome, and the melodies of the album hold it together, pushed forward by the pounding, and at times galloping, drums. Since this is GOTHIC KNIGHTS fourth album, you’d obviously expect them to know what they’re doing, which of course, they do. But you don’t ever get the feeling that they’ve become complacent and have just gone through the motions of making an album without putting much thought into it. The listener can see that a lot of care and attention has gone into “Reflections From The Other Side”, in the way the song’s have been arranged, and the quality of the lyrics. Tzantis and Saligman are awesome guitarists, delivering riffs that will melt your face, along with Cosentino’s bass playing which even gets its own spotlight during the intro to “Devil’s Playground”. Sloan’s excellent keyboards accompany Sanchez’s brilliant Power Metal vocals very well. This release doesn’t bring anything new into the genre, but to be honest, I don’t think anyone was really expecting it to. As an album, overall, it’s excellent, and very reminiscent of when Metal was at its peak. So if you want to enjoy a good, solid Metal album, then look no further than this.